You don’t have to be an expert golfer to dominate the mini-golf course. A little patience, aim, and sense of humor are all you need to sink a hole in one (or six or seven!). 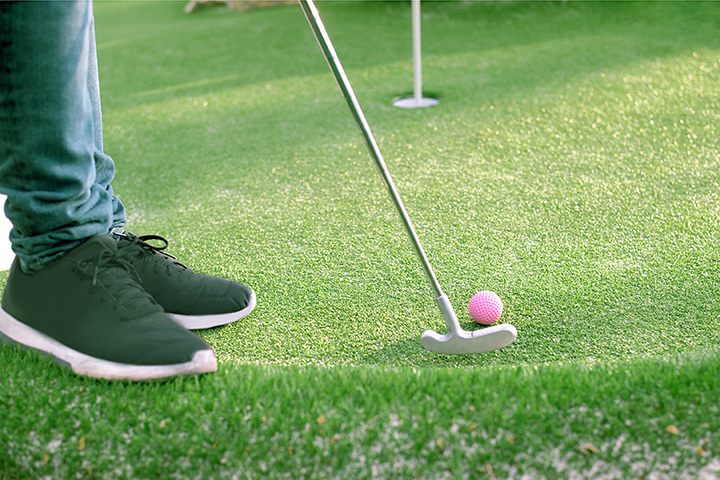 You’ll find tons of family-friendly putt-putt courses throughout Georgia where you can earn bragging rights as being the master of mini golf. Put your putting skills to work at these 10 best mini golf courses in Georgia. This entertainment center has some of the best attractions in the state, including an epic mini golf course you’ll want to play more than once. The Caddyshack indoor course is the perfect escape from the Georgia summer heat or cold winter days, complete with a unique Wild West/Jurassic era theme throughout. The scenery is top-notch and the courses are the ideal balance of challenging and fun. This mountainside mini golf destination perfectly embodies Helen’s German-inspired vibe. Its waterfalls, streams, and scenery give it a middle-of-nowhere look and feel, even though it’s close to all of the town’s best attractions. With two courses and a huge arcade, you can keep the fun going all day long. This mini golf/cineplex combo is out of this world! Head to The Fringe offers a play-all-day price of just $14, giving you one of the best values for your money. Guests love the immaculate course, complete with its fair share of challenges that keep the game interesting but not overly complicated. This multi-course mini golf destination captures the area’s history and transforms it into fun for all ages. Take your pick between a railroad theme, mining theme, or a special glow course, each one full of unique twists and turns as you get a heaping dose of local lore and history. The scenery alone is worth the trip. This woodland mini golf course is one of the most unique attractions in Georgia. The course was designed to seamlessly blend in with its natural surroundings, including gorgeous views of waterfalls, streams, and even a play-through cave. It’s a relaxing experience you’ll want to enjoy more than once. The ultimate blacklight mini golf experience, this place will have you howlin’ with fun. Masterful monster creations decorate every hole in this indoor experience. Perfect for rain or shine, this place is every bit as artistic as it is memorable. This tropical oasis transports you straight to mini golf paradise. One price covers gameplay on two courses so you can get the best bang for your buck. Or, upgrade your ticket to a wristband and get unlimited mini golf and go-karts. This is by far one of the most well-designed courses in Georgia. The mega pirate ship looks almost too real to be decor, plus there are tons of beautiful waterfalls throughout the course that makes you feel like you've entered a tropical paradise. Every hole is an adventure waiting to be conquered. This fun mecca is perfect for families, couples, and groups alike. With three courses to choose from, you can spend the whole afternoon perfecting your putt and making memories. There’s also an on-site arcade and go-kart track to keep the party going all day. Uniquely designed and completely indoors, this whimsical course is an adventure in itself. It’s small enough to keep you engaged but big enough to give you plenty of game time. And at just $6 per game and lots of other activities on site, it’s a great value for families to entertain the kids all day.